Pictured above are members of the Barry County Genealogical and Historical Society with the donor of some new items in the Bayless House. From left to right: Georgia Hart, BCGHS; Fredalene Horner; and Sylvia Blankenship, BCGHS. 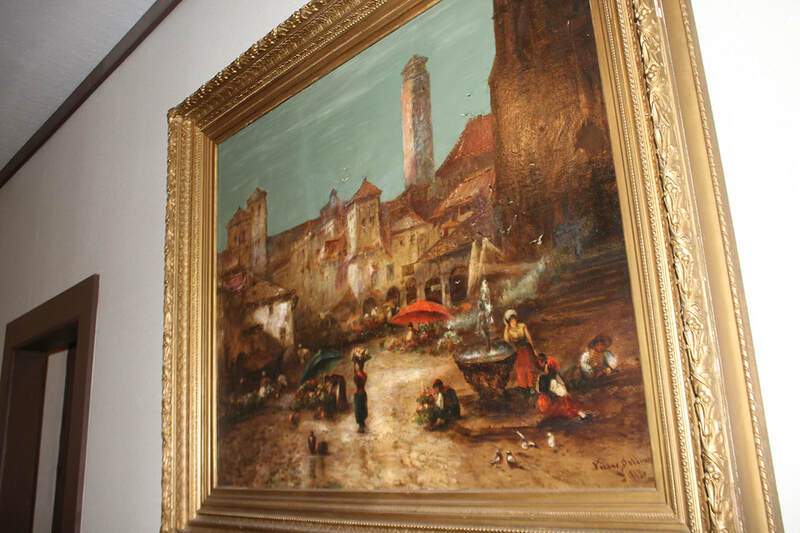 Pictured above is the 1819 Victor Dolding painting Fredalene Horner donated recently to the Bayless Home for display. The Bayless home was originally built in the late 1870s by John M. Bayless. By 1879, Bayless wrote in his journal that they were living comfortably in the home. His complete journal has been copied and archived to be displayed in the home once the renovations are complete. Bayless and his brother, W. K. Bayless, originally lived in Washburn. He would eventually become a well-known and respected community member, serving as a county official. Bayless came from humble beginnings, but worked his way up to owning a mercantile store and lumberyard, as well as beginning the first private bank in the county. Bayless lived in Cassville until 1901 when he moved to Claremore, Oklahoma, until his death in 1907. The iconic home on Townsend would become part of his heritage and history. Following the Bayless family, the home was purchased by the Salyer family who made a variety of changes, including a different porch and conversion of the interior to house apartments in the 1930s. John Q. Hammons was a tenant in the home at one point, sparking his generous donation to help reclaim the house and preserve it for historical reasons. In 2000, the home was purchased from the widow of the late Dr. Johnson, who also had an office next door to the property. The renovations to the home have been dramatic to bring the two-story red brick building up to code while maintaining historical integrity. The back portion of the building had to be completely rebuilt when the brick walls collapsed. The roof had to be redone, including the clay tiles. The porch’s ceiling is adorned with custom-made tin tiles matching the originals. The originally-collapsed back portion is now the Roden Room, dedicated to Mildred and Lorn Roden for their efforts in raising funds for the project. This room is a research room, including a donated microfilm reading machine. The Lea Room sits next to the Roden room, which is where the old marriage records from the Barry County Courthouse are housed. Mrs. Bob Lea gave the funding in memory of her husband. For the home, most donations have been made in honor or memory of a loved one with ties to the area. Each window will have a plaque beside it, naming the person who was honored by the donation. To make a donation to the Bayless House, contact the Barry County Genealogical and Historical Society, contact Georgia Hart, at (417) 271-3521. All donations are tax deductible. Or mail them to the Barry County Genealogical and Historical Society, PO Box 291, Cassville, MO 65625. In 17 years, a historic home in Cassville has gone from condemned to renovated, and will soon be opening up for meetings and special groups. Thanks to the efforts of the Barry County Genealogical and Historical Society (BCGHS), the Bayless (also known as the Bayless-Salyer) House has new life breathed into it. Last week, BCGHS member, editor and registrar Georgia Hart was on site to talk about recent renovations, the last few things still needed by the group and to show off a recent donation of furniture and a painting by local antique collector Fredalene Horner. In 2000, the group stepped forward to purchase the home after it had been condemned by the City of Cassville. A back section of the home had caved in and it was, by all definitions, uninhabitable. As soon as they bought it, they began working on it. As donations slowly came in, the group would refinish things. While a lot of the brickwork and flooring was original, many other things had to be redone or patched up. In 2014, a large donation from a former Barry County resident’s estate provided the momentum for the group to get most of the house finished. That donation of $50,000, by the late Margie Pannell, put the BCGHS much closer to their goal of being able to offer the historic home for meetings and get togethers. With new windows, a newly finished staircase and improvements throughout, there are only a few things the group hopes to complete. Hart said, “We still need a stove for the kitchen and a little table for in there, as well. Then we need an old dining table and chairs.” Other items include electric fireplaces for the double back-to-back fireplaces that were in the home originally. Horner’s donation of furniture included five chairs, a couch and painting by Victor Dolding from 1819. She said the painting was purchased at an auction in Springfield. The scene is a marketplace in Rome.